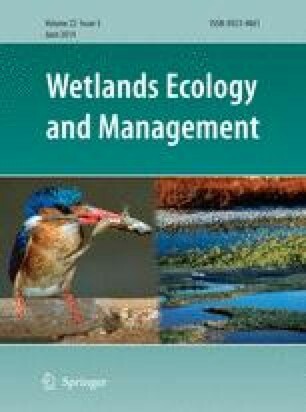 Invasive plants can substantially modify wetland structure and animal distribution patterns. In eastern North America, a Eurasian haplotype of the common reed (Phragmites australis, haplotype M) is invading wetlands. We studied the invasion of common reed in freshwater wetlands of an urbanized landscape and its effects on the distribution of amphibians at different life stages. Specifically, we hypothesized that the probability of reed invasion would be greatest in wetlands near anthropic disturbances. We predicted that the probability of desiccation at sampling stations increases with reed cover. Furthermore, we expected that wetlands invaded by common reed would have lower amphibian abundances, apparent survival, and rates of recruitment. We conducted trapping surveys to compare anuran assemblages of tadpoles, juveniles, and adults in 50 wetlands during two field seasons. The probability of reed invasion in wetlands increased with the cover of heavily-managed areas within 1,000 m and the distance to the nearest forest, but decreased with the length of roads within 1,000 m. The probability of station desiccation increased with reed cover. We found no evidence of a negative effect of reed presence on anuran population parameters, at any life stage. Landscape variables, such as the percent cover of forest or heavily-managed areas within a given radius from each wetland, influenced the abundance or the apparent survival of juvenile frogs and the abundance of ranid tadpoles. Our results show that amphibian patterns depend more strongly on the structure of the landscape surrounding wetlands than on exotic reed invasion in wetlands. Thanks to D. Chatillon, V. Vermette, D. Rodrigue, J.-F. Houle, S. Comptois for granting park access and lending field equipment. We used the Colosse high performance computing cluster of Calcul Québec to run certain models and assess model fit. This study was funded by National Sciences and Engineering Research Council (NSERC), the Fonds Québécois pour la recherche en nature et technologie (FQRNT), Ducks Unlimited Canada, the Canadian Wildlife Service, and the Quebec department of natural resources and wildlife (MRNF). V. Spinelli, V. Jourdan, V. Bonner, A.-A. Marmette, A. Daoust-Labelle, and A.-A. G. Payette assisted with the field work. S. Rouleau assisted in site selection. Comments from two anonymous reviewers improved the manuscript. R Core Team (2012) R: a language and environment for statistical computing. R Foundation for Statistical Computing, Vienna, Austria. http://www.cran.r-project.org/.